Selecta Tyre Ltd understands that your privacy is important to you and that you care about how your personal data is used and shared online. We respect and value the privacy of everyone who visits this website, www.selectatyre.co.uk (“Our Site”) and will only collect and use personal data in ways that are described here, and in a manner that is consistent with Our obligations and your rights under the law. “We/Us/Our”means Selecta Tyre, a limited company registered in England under company number 1093373, whose registered and main trading address is The Front Fairfield, Buxton, Derbyshire, SK17 7EQ. 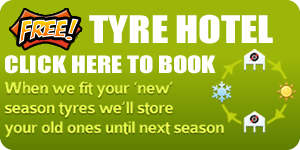 2.1Our Site is owned and operated by Selecta Tyre, a limited company registered in England under number 1093373, whose registered and main trading address is The Front Fairfield, Buxton, Derbyshire, SK17 7EQ..
2.2Our VAT number is GB 120 7249 02. 2.3Selecta Tyre Ltd have an appointed Data Protection Officer who can be contacted by email at nh@selectatyre.co.uk, by telephone on 01298 212368, or by post at The Front Fairfield, Buxton, Derbyshire, SK17 7EQ. 6.3With your permission and/or where permitted by law, We may also use your data for marketing purposes which may include contacting you by email, telephone, text message, post with information, news and offers on Our products and services. We will not, however, send you any unsolicited marketing or spam and will take all reasonable steps to ensure that We fully protect your rights and comply with Our obligations under the GDPR and the Privacy and Electronic Communications (EC Directive) Regulations 2003. 6.4Third parties whose content appears on Our Site may use third party Cookies, as detailed below in section 13. Please refer to section 13 for more information on controlling Cookies. Please note that We do not control the activities of such third parties, nor the data they collect and use and advise you to check the privacy policies of any such third parties. 6.5You have the right to withdraw your consent to Us using your personal data at any time, and to request that We delete it. 6.6.3Refer to Google's Compliance Statement for data held in Google Analytics (https://privacy.google.com/businesses/compliance/). 7.4.3Policy for data retention and destruction. 9.2In the event that any of your data is to be transferred in such a manner, you will not be contacted in advance and informed of the changes. 11.1You may access Our Site without providing any data at all. However, to use all features and functions available on Our Site you may be required to submit or allow for the collection of certain data. You have the right to ask for a copy of any of your personal data held by Us (where such data is held). Under the GDPR, no fee is payable and We will provide any and all information in response to your request free of charge. Please contact us for more details at nh@selectatyre.co.uk, or using the contact details below in section 14. 13.2By using Our Site you may also receive certain third party Cookies on your computer or device. Third party Cookies are those placed by websites, services, and/or parties other than Us. Third party Cookies are used on Our Site for analytical and site usage purposes. For more details, please refer to section 6, above, and to section 13.6 below. These Cookies are not integral to the functioning of Our Site and your use and experience of Our Site will not be impaired by refusing consent to them. 13.3All Cookies used by and on Our Site are used in accordance with current Cookie Law. 13.4Before Cookies are placed on your computer or device, you will be shown a pop-up message requesting your consent to set those Cookies. By giving your consent to the placing of Cookies you are enabling Us to provide the best possible experience and service to you. You may, if you wish, deny consent to the placing of Cookies; however certain features of Our Site may not function fully or as intended. 13.5Certain features of Our Site depend on Cookies to function. Cookie Law deems these Cookies to be “strictly necessary”. These Cookies are shown below in section 13.6. Your consent will not be sought to place these Cookies, but it is still important that you are aware of them. You may still block these Cookies by changing your internet browser’s settings as detailed below in section 13.10, but please be aware that Our Site may not work properly if you do so. We have taken great care to ensure that your privacy is not at risk by allowing them. 13.7Our Site uses analytics services provided by Google. Website analytics refers to a set of tools used to collect and analyse anonymous usage information, enabling Us to better understand how Our Site is used. This, in turn, enables Us to improve Our Site and the products and services offered through it. You do not have to allow Us to use these Cookies, however whilst Our use of them does not pose any risk to your privacy or your safe use of Our Site, it does enable Us to continually improve Our Site, making it a better and more useful experience for you. 13.8The analytics service(s) used by Our Site use(s) Cookies to gather the required information. _ga, _gat, _gid First This website These cookies are used to collect information about how visitors use our site. We use the information to compile reports and to help us improve the site. The cookies collect information in an anonymous form, including the number of visitors to the site, where visitors have come to the site from and the pages they visited. 13.10In addition to the controls that We provide, you can choose to enable or disable Cookies in your internet browser. Most internet browsers also enable you to choose whether you wish to disable all cookies or only third party Cookies. By default, most internet browsers accept Cookies but this can be changed. For further details, please consult the help menu in your internet browser or the documentation that came with your device. 13.11You can choose to delete Cookies on your computer or device at any time, however you may lose any information that enables you to access Our Site more quickly and efficiently including, but not limited to, login and personalisation settings. 13.12It is recommended that you keep your internet browser and operating system up-to-date and that you consult the help and guidance provided by the developer of your internet browser and manufacturer of your computer or device if you are unsure about adjusting your privacy settings.